How Much Does the Average Virtual Assistant Earn? A Virtual Assistant’s salary ranges from $300 to $1000 a month depending on their skills. A programmer will obviously require a higher salary as compared to a data entry specialist, which is almost the same case with office-based jobs. Below is a gist of VA salaries. You can find a more complete list here. For office based jobs in the Philippines, there are other factors in play such as the tendency to base salary rates on the government mandated minimum salary and the progressiveness on the industry they are in. The sad part is, for office-based jobs, majority of the rates really are based on the minimum salary requirement. When you compare average salaries in the Philippines with other countries, you begin to see why the Philippines is the fastest growing outsourcing market. When you combine the talent level in the Philippines with the average salaries, the Philippines becomes downright compelling. How much does the average Filipino have to spend? 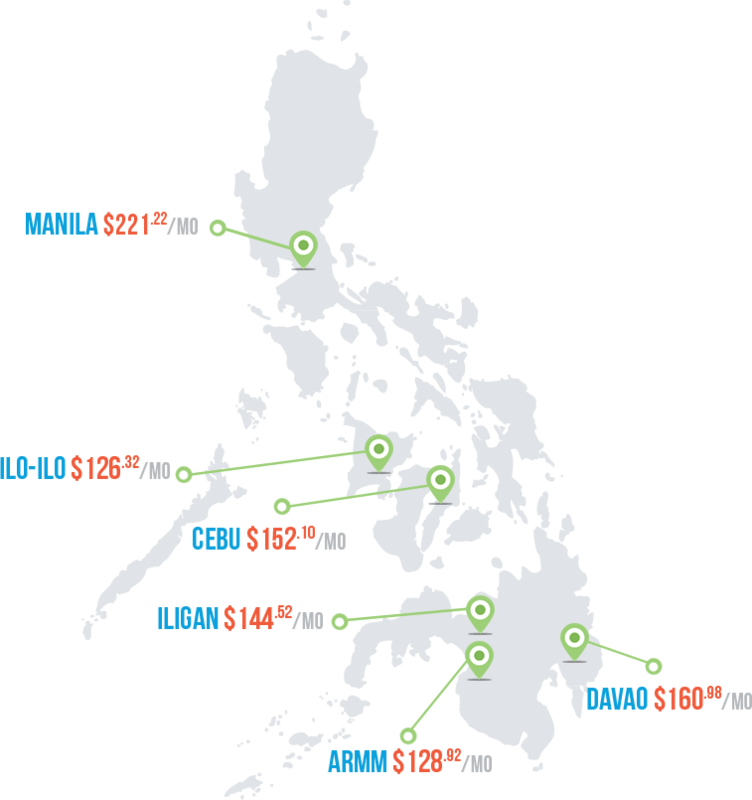 To make it easier for you to formulate a rating of your own for your future VA’s, or if a raise is long overdue, we also have a chart on the cost of living in the Philippines. This includes the utilities that they need to fully function in the virtual assistant world. Again, the chart only includes the basic utilities. Please keep in mind that there are other costs one requires in order to live, like clothes, mobile devices, and anything that allows them to go about their actual lives. How old and experienced are these virtual assistants? In the Philippines, a college degree is a prerequisite in order to get a job. That’s why majority of Virtual Assistants are college educated. What are the optional benefits that employers can pay for? As you can see, with Filipino workers, you don’t have to break the bank to give these highly skilled workers a living wage. If you just look at their salary in terms of numbers, yeah they do look insignificant compared to ours. But if you’re that Filipino VA, that $500 or $600 per month will get you more than most Filipino workers get. That amount gets them better meals for their families, better education for their kids, better lives overall. It’s a small amount to you but a big blessing for them. So the next time someone accuses you of exploiting workers because you outsource, show them these numbers. Ask them what exploitation looks like and show them pictures of your VA being able to send their kids to private school and get iPhones for themselves. If this is exploitation, then giving them a “fair” wage would be winning the lottery.